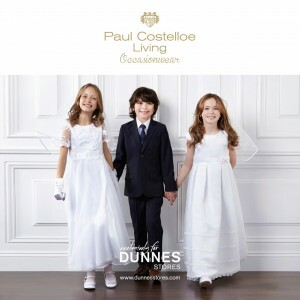 The new Paul Costello Communionwear Collection has arrived in Dunnes Stores here in City Square. Simple stylish dresses, headpieces, shoes, and accessories for her. Smart suits, ties, shirts and shoes for him. All they need to look their best for their First Holy Communion. With beautifully crafted dresses, suits and accessories, find the perfect pieces to match the occasion. Check them out here online before checking them in store.